Despite the threat of overcapacity' in the cruise shipping industry', newbuilding contracts have remained on a constant high — specifically in the mega ship sector. This new trend, which seems to have taken on a life of its own in the industry, beginning with Royal Caribbean's Voyager of the Seas, has carried over to Cunard, which has hired Chantiers de 1' Atlantique to construct what is set to be the world's largest ocean liner. Measuring 1,131 ft. 345 m) with a 131 ft. (40 m) beam, the $7X0 million vessel, according to its designers at Tillberg Design, will exemplify the classic British style that is representative of Cunard. 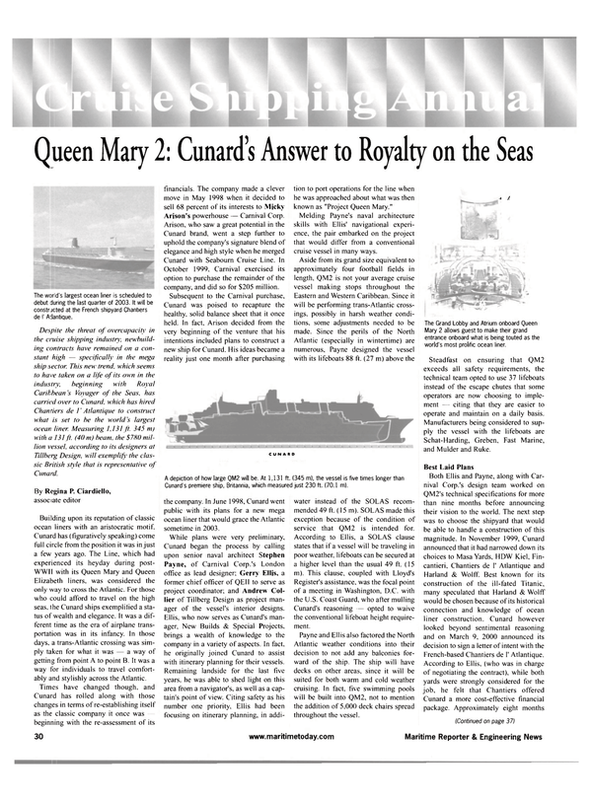 By Regina P. Ciardiello, associate editor Bui lding upon its reputation of classic ocean liners with an aristocratic motif. Cunard has (figuratively speaking) come full circle from the position it was in just a few years ago. The Line, which had experienced its heyday during post- WW1I with its Queen Mary and Queen Elizabeth liners, was considered the only way to cross the Atlantic. For those who could afford to travel on the high seas, the Cunard ships exemplified a status of wealth and elegance. It was a different time as the era of airplane transportation was in its infancy. In those days, a trans-Atlantic crossing was simply taken for what it was a way of getting from point A to point B. It was a way for individuals to travel comfortably and stylishly across the Atlantic. Times have changed though, and Cunard has rolled along with those changes in terms of re-establishing itself as the classic company it once was beginning with the re-assessment of its financials. The company made a clever move in May 1998 when it decided to sell 68 percent of its interests to Micky Arison's powerhouse Carnival Corp.
Arison, who saw a great potential in the Cunard brand, went a step further to uphold the company's signature blend of elegance and high style when he merged Cunard with Seabourn Cruise Line. In October 1999. Carnival exercised its option to purchase the remainder of the company, and did so for $205 million. Subsequent to the Carnival purchase, Cunard was poised to recapture the healthy, solid balance sheet that it once held. In fact, Arison decided from the very beginning of the venture that his intentions included plans to construct a new ship for Cunard. His ideas became a reality just one month after purchasing the company. In June 1998, Cunard went public with its plans for a new mega ocean liner that would grace the Atlantic sometime in 2003. While plans were very preliminary, Cunard began the process by calling upon senior naval architect Stephen Payne, of Carnival Corp.'s London office as lead designer; Gerry Ellis, a former chief officer of QEII to serve as project coordinator; and Andrew Collier of Tillberg Design as project manager of the vessel's interior designs. Ellis, who now serves as Cunard's manager, New Builds & Special Projects, brings a wealth of knowledge to the company in a variety of aspects. In fact, he originally joined Cunard to assist with itinerary planning for their vessels. Remaining landside for the last five years, he was able to shed light on this area from a navigator's, as well as a captain's point of view. Citing safety as his number one priority, Ellis had been focusing on itinerary planning, in addi addition to port operations for the line when he was approached about what was then known as "Project Queen Mary." Melding Payne's naval architecture skills with Ellis' navigational experience, the pair embarked on the project that would differ from a conventional cruise vessel in many ways. Aside from its grand size equivalent to approximately four football fields in length, QM2 is not your average cruise vessel making stops throughout the Eastern and Western Caribbean. Since it will be performing trans-Atlantic crossings. possibly in harsh weather conditions, some adjustments needed to be made. Since the perils of the North Atlantic (especially in wintertime) are numerous, Payne designed the vessel with its lifeboats 88 ft. (27 m) above the water instead of the SOLAS recommended 49 ft. (15 m). SOLAS made this exception because of the condition of service that QM2 is intended for. According to Ellis, a SOLAS clause states that if a vessel will be traveling in poor weather, lifeboats can be secured at a higher level than the usual 49 ft. (15 m). This clause, coupled with Lloyd's Register's assistance, was the focal point of a meeting in Washington, D.C. with the U.S. Coast Guard, who after mulling Cunard's reasoning — opted to waive the conventional lifeboat height requirement. Payne and Ellis also factored the North Atlantic weather conditions into their decision to not add any balconies forward of the ship. The ship will have decks on other areas, since it will be suited for both warm and cold weather cruising. In fact, five swimming pools will be built into QM2, not to mention the addition of 5,000 deck chairs spread throughout the vessel. Steadfast on ensuring that QM2 exceeds all safety requirements, the technical team opted to use 37 lifeboats instead of the escape chutes that some operators are now choosing to implement — citing that they are easier to operate and maintain on a daily basis. Manufacturers being considered to supply the vessel with the lifeboats are Schat-Harding, Greben, Fast Marine, and Mulder and Ruke. Best Laid Plans Both Ellis and Payne, along with Carnival Corp.'s design team worked on QM2's technical specifications for more than nine months before announcing their vision to the world. The next step was to choose the shipyard that would be able to handle a construction of this magnitude. In November 1999, Cunard announced that it had narrowed down its choices to Masa Yards, HDW Kiel, Fincantieri, Chantiers de 1' Atlantique and Harland & Wolff. Best known for its construction of the ill-fated Titanic, many speculated that Harland & Wolff would be chosen because of its historical connection and knowledge of ocean liner construction. Cunard however looked beyond sentimental reasoning and on March 9, 2000 announced its decision to sign a letter of intent with the French-based Chantiers de 1' Atlantique. According to Ellis, (who was in charge of negotiating the contract), while both yards were strongly considered for the job, he felt that Chantiers offered Cunard a more cost-effective financial package. Approximately eight months after Cunard announced that it had chosen Chantiers for the project, the company penned a final contract with the yard on November 6, 2000. Subsequent to the contract's signing, it was announced that QM2 would be constructed to Lloyd's Register classification standards, which will ensure that the vessel is the safest afloat on the high seas. "We are delighted to have been awarded this contract", said LR's Londonbased classification and regional support passenger ship manager John Rugg. "This achievement clearly demonstrates the confidence that Cunard has in our passenger ship expertise. We have been working hard on this prestigious project for some 20 months now, and are confident we are on target to deliver the necessary solutions to help enhance Cunard's quality, safety, environmental and business performance." Although the first steel for the vessel is not expected to be cut until January 2002, the yard already has the electrical production lists in its hands and is ready to negotiate with potential suppliers. While many of QM2's manufacturers have not been chosen, it has been noted that the vessel will boast a power supply of four Wartsila common rail diesel engines — supplemented by two gas turbines. All six engines will produce electricity through two switchboards as needed for propulsion — enabling the ship to move at a top speed of approximately 30.5 knots. While Cunard confirmed that the Wartsila smokeless engines would be implemented onto the vessel (Carnival Corp. recently partnered with Wartsila on this effort), it has not yet chosen a supplier for the gas turbines. While, according to Ellis, the gas turbine decision basically comes down to Rolls-Royce or General Electric Packaged Power (S&S Energy Products), both have formidable reputations in the marine industry. Rolls-Royce's turbines are known for their high power, despite small size; GE for tremendous reliability in naval application. Ellis however would say that if Rolls-Royce was chosen for the job, then the vessel would more than likely house Rolls- Royce-owned Brown Brothers stabilizers and Kamewa thrusters. Typically taking up small amounts of space in a vessel's engine room, the turbines designed for QM2 posed a bit of a problem during the planning process. The general arrangement drawings showed that the area in which they were placed was blocking off a stairway for top access to the ship. Not wanting to scrap the stairway altogether, while still being able to instill the gas turbine power, the design team reconfigured the stairway — free from the gas turbine's reach. Specialized Designs For A Special Ship It is estimated that QM2 will be 10 percent larger than Royal Caribbean's Voyager of the Seas, which currently holds the cruise industry's distinction as the largest operating vessel. Contributing to the vessel's unique and innovative ability to steam along at such high speeds, despite its large size and strength is its specialized hull. This streamlined, speedboat-like hull was an expensive undertaking, but well worth the cost to Cunard, as it is longer, thinner, deeper and hydrodynamically smooth — providing the vessel with the utmost strength and speed. This innovative hull, which bears much similarity to QEII's, also requires thicker steel that weighs more than most. The vessel also boasts a sharp bow and a hybrid stern. This specialized stern, will literally round out the conventional square shaped stern for better hydrodynamic efficiency. Mixing the rounded with the square-shape stern was developed in response to the rough seas that QM2 may experience throughout its travels. The vessel's interior will boast creations of the renowned firm of Tillberg Design. Best known for its innovations onboard both Crystal Harmony and Symphony, and current involvement on the two new U.S. Lines ships, the Tillbergs have architects from all three of their offices (U.K., Sweden and U.S.) involved in making QM2's classic British style a reality. Heading up the QM2 interior design team is Andrew Collier of Tillberg's London office, who reaffirmed his desire to re-create the designs from old ocean liners, such as the original Queen Mary. He was also inspired by French ocean liners, which are indicative of many of his designs. Collier, along with Fredrik Johansson of Tillberg's Sweden office, discussed with MR/EN the many challenges and ideas that went into the development of QM2's character. Collier cites that the QM2 project is similar to the concept of the new Volkswagen Beetle or new Jaguar in that its focus is to blend a classic design with modern technology. In visualizing his concept for QM2's confines, Collier cites Carnival Corp.'s Payne as an inspiration. Not only the lead naval architect on the project — Payne also happens to be a great fan of historical ocean liners. This, coupled with Payne's optimal placement of various rooms on the vessel, allowed Collier and the Tillberg team to experiment with a wide variety of ideas. For instance, Collier cites that since the ship's dining room was placed in an area where a minimal amount of movement is felt, he was able to add a solid column structure without worrying that it would come apart. While some may compare the vessel's design to one that is quite similar to the Titanic, passengers will not feel this vibe, as Collier and Johansson designed most of the staterooms to exude a "shelved, safe feel," with rounded corners and warm timbers. More challenging though, according to Collier, was the confines of space that he was working with. He's referring to the vessel's unusually high decks that tower 200-ft.
above the waterline (equivalent to a 23- story building) and large chunks of steel that were present due to the vessel's specialized hull. In terms of dining options, the vessel will feature a Cunard tradition — the classic "Grill Room" — a three-deck high main dining room spanning the full width of the vessel. A sweeping central staircase will be the ship's apex — emulating the grand days of a stately dining experience onboard a classic ocean liner. Stepping outside onto the deck, it's difficult not to hear QM2's whistle, which is audible from 10 miles away - no doubt announcing that Cunard's past lies in its future once again.